"I inspected my tires but still had a failure"
"Checked the air in all 4 tires and inspected them before we pulled out. We made it 20 miles from the house when the first tire let go. The tire service center and I both checked the remaining 3 and the spare. They had the correct air pressure and no signs of any issues. We made about 15 miles down the road and the second 1 blew out -- 2 roadside assistance calls and 2 insurance claims. I am not happy with dynamic tire or (RV trailer company name) at the moment." Sounds like the "inspections" being done are not sufficiently detailed. A "proper and complete" inspection doesn't consist of checking the outside sidewall and most of the tread for % tread wear. A LOT more is required if you want to improve your chances of finding the early signs and indications of impending tire failure. In this blog, I have previously covered what I would consider a thorough inspection with example of what a failing tire looks like externally, and then I did an autopsy to show the actual condition of the subject tire. Note that the person making the video felt the tire had failed and cut the tire looking for the belt separation but even though he has an engineering and mechanical background, he failed to properly identify the location of the failure. IMO this was because he simply had not had enough experience in tire forensics, as you probably have to do a minimum of a few dozen autopsies before you can easily and quickly know where to do the cutting -- and that would be what is needed to find a large separation as seen in the subject tire. Smaller issues are harder to find and take a more experienced eye. The free spin can be sufficient to establish that the subject tire is in the process of failing and should not be driven on. Today it is popular in politics to complain about "the elite" and to disdain experience, but I believe that there are many fields where actual experience is necessary if you want competent results. Very few tire service people have been given the opportunity to do investigative-level tire inspection, as their job normally doesn't require issuing a detailed report that identified the root cause of a tire failure. This not the tire tech's fault nor is it the fault of the tire store owner. You might liken this to the store clerk at a CVS or Walgreen pharmacy. They are simply not fully knowledgeable in the interaction of medications, which is why a Pharmacist is the person responsible to fill prescriptions, but I would not trust a Pharmacist to do surgery. Sometimes competence only comes with experience. Last week I addressed the topic of tire age. Some are still asking why there isn't a better and clearer age limit on tires in RV use. It may help if there is a better understanding of the complexities of what is involved in making the prediction. I think that most can understand that the numerous variables involved such as ambient temperature, operating temperature, load, and operating speed all can affect the "life" of a tire. Also there is the obvious variation in the numerous components and assembly practice of each tire itself. All of this adds up to an impossibly complex equation if trying to predict the life of a tire. While many may understand that if a tire spends its life in Arizona, Texas, Alabama, Louisiana or Florida, it will have a definitely different life span than one that spends its life in New England, even if the load, inflation and speed were magically identical. I do wonder how many have even a passing understanding of the complex nature of manufacturing a tire as seen in THIS animated video. Actual shots of the process are here. Here is an alternate view of the truck tire process, which would be essentially identical to what is seen in both LT and 22.5" size tires. If you watch only one video, IMO this 3rd one is the best and most informative. Unlike materials like steel or aluminum, rubber is not a homogeneous material so even minor variations in the raw materials can affect raw material properties and ultimately tire life. Here is a video showing the basic process of preparing rubber before it is applied to steel or polyester cords. Note these are videos of very low tech methods. Modern equipment is much larger and the process is harder to see as there is much more automation behind closed chamber shields. The estimates of maximum tire life are based on assumptions of the variability of the tire and the variability of the use of the tire. The estimate must also consider the probability of the variables stacking up and the potential for the severity of the tire failure. Some companies may feel that no greater than 0.5% probability of failure at 7 years is acceptable IF the tire is always operated in North America, never exceeds its max speed rating or is overloaded for the inflation in the tire. Another company may feel that less than 5% at 12 years is the goal. It is also important to remember that only after thousands of tires have completed years of service can a company know if it made the correct calculations. I do not know of any company that is not constantly working to lower the failure rate or extend the usage time while at the same time trying to meet customer demands for better wear, fuel economy, traction, ride and lower cost, and the order of priority for these and other variables the customer wants in their tires. While compromising safety is never a consideration, the rank order of the dozens of performance characteristics can have an effect on tire life. Here is a challenge with hypothetical information. 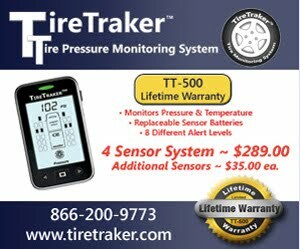 Would all RV owners be happier if they were told that the maximum age of tires was 8 years BUT it would be illegal to operate on a tire older than 8 years or operate without a load, temperature and pressure monitor and recording system "black box" system and tire warranty would only be good 4 of the 8 year life? Oh ya, the "black box" monitor system would add $500 to the initial cost of the RV and there would be a required annual fee of $75?